The dress code for the event is morning dress -- the daytime equivalent of evening formal wear -- which means that the men (including the king) wear a morning coat, a waistcoat, and striped trousers, while the women wear long gowns with hats. 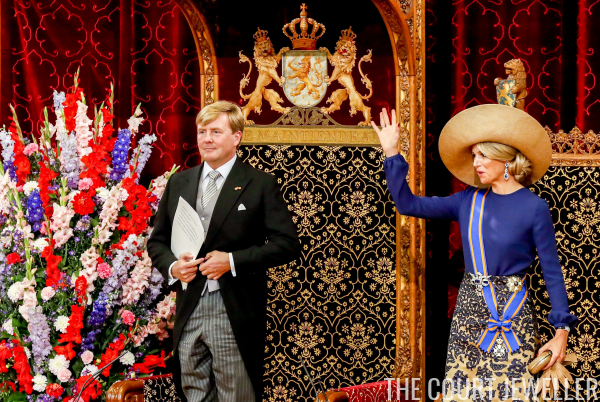 This year, Queen Maxima wore a vivid gown that featured a royal blue blouse and an elaborate embroidered gold and navy skirt. She also wore one of her trademark hats: an exaggerated, architectural piece that sits at a dramatic angle. With her sapphire-colored gown, Maxima wore some of the family's grandest sapphire jewels. Her earrings are the elaborate figure-eight-shaped diamond and sapphire earrings. They were made in the early 1960s using stones from the dismantled tiara from Queen Wilhelmina's wedding gift parure, and they're part of the family's jewel foundation. 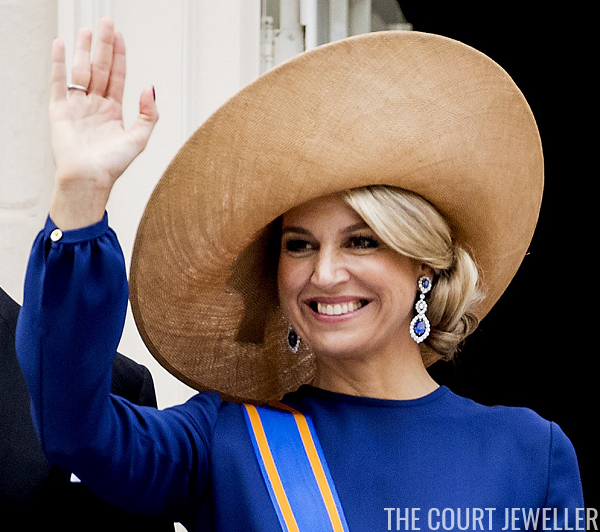 On her right hand, Maxima wore the large diamond ring that she received from Willem-Alexander after the birth of their third daughter, Princess Ariane. The ring features an impressive emerald-cut diamond flanked by two smaller diamonds. The absolute jewelry showstopper of the day was the brooch that Maxima pinned to the waist of her gown (and over the top of the sash of the Order of the Netherlands Lion): the stunning diamond and sapphire corsage ornament that once belonged to Queen Wilhelmina. 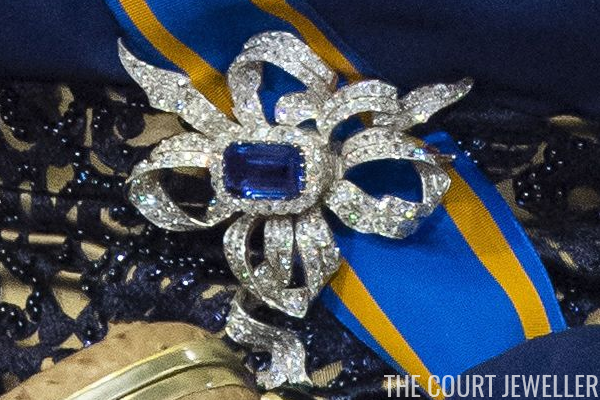 The sapphire in the center of the brooch may have an even longer legacy -- it's possible that it once belonged to Queen Anna, the Romanov-born wife of King Willem II. 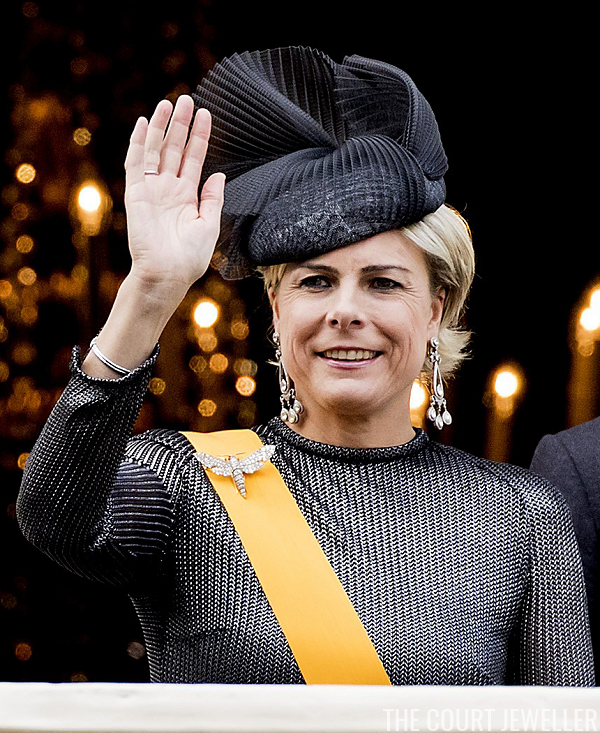 The only other senior members of the royal family who attend Prinsjesdag these days are the king's brother, Prince Constantijn, and his wife, Princess Laurentien. Her diamond chandelier earrings are of particular interest, because they're generally thought to belong personally to Queen Maxima. Perhaps they were a sister-in-law loan for the day? Laurentien also secured the sash of the Order of the House of Orange with a jewel from the family collection: the diamond moth brooch.